FILE - In this photo taken on July 7, 2018, US Army from NATO and Afghan commando forces are pictures in a checkpoint during a patrol against Islamic State militants at the Deh Bala district in the eastern province of Nangarhar Province. China has advised the United States against staging an abrupt troop withdrawal from Afghanistan and called for collective international efforts to help initiate a peace process between the South Asian nation's warring parties. The remarks by a top Chinese diplomat Sunday in neighboring Pakistan come amid unconfirmed media reports suggesting President Donald Trump has ordered pulling out half of the more than 14,000 U.S. troops stationed in Afghanistan. 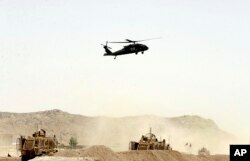 FILE - A US military helicopter flies over the site of a suicide bomb that struck a NATO convoy in Kandahar south of Kabul, Afghanistan, Aug. 2, 2017. “They [U.S.] have been in Afghanistan for 17 years. If they are leaving the country, they should try to leave in a gradual and a responsible way,” said Lijian Zhao, deputy Chinese ambassador in Islamabad. Speaking to Pakistani television station GTV News, Lijian emphasized the need for the Taliban and Afghan government to sit together and negotiate a political resolution to a war he said has been going on for nearly 40 years. Only an Afghan-led and Afghan-owned process supported by international partners of Afghanistan could help end the hostilities, Lijian noted. “If a civil war broke out after the U.S. withdrawal, the first countries affected will be Pakistan, will be China, and it will be the immediate neighbors. So, we have to sit together with the parties concerned so that we start a peace process,” he said. The U.S. has recently engaged in direct talks with the Taliban to convince them to engage in peace negotiations with the Afghan government. But reports of a potential U.S. withdrawal from the country have worried critics who say the move would reduce the incentive for insurgents to halt fighting and negotiate a deal. Lijian reiterated Beijing’s worries that a volatile Afghanistan would encourage terrorists linked to the outlawed East Turkistan Islamic Movement, or ETIM, to foment violence in the western Chinese region of Xinjiang. The militant group claims to be fighting for the rights of the Uighur Muslim community in Xinjiang, which shares a border with both Afghanistan and Pakistan. “They are still in Afghanistan. 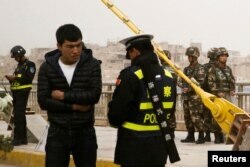 They are still posing a threat to the national security of Xinjiang, of China. What they want is to establish a separate state, to separate Xinjiang out of China. This is totally unacceptable to China. So, we will work with the Afghan government to try to eliminate this group,” Lijian pledged. The Chinese diplomat rejected as "groundless Western propaganda" reports that his country was suppressing religious freedom and the rights of Uighur Muslims in the name of fighting terrorism. International human rights groups have expressed concerns that China is forcing Uighur and other Muslim minorities to quit their religious beliefs in internment camps set up in Xinjiang under the guise of vocational education centers. FILE - An Uighur woman rests near a cage protecting heavily armed Chinese paramilitary policemen on duty in Urumqi in China's northwestern region of Xinjiang, May 1, 2014. Lijian noted that ETIM is declared a terrorist organization by the United Nations. He said that Chinese authorities, particularly those in Xinjiang, have taken measures against terrorists linked to the group, which has resulted in “zero” incidents of terrorism in the last two years. The Chinese diplomat lamented that Western media describe counterterrorism moves in other parts of the world as "actions for maintaining peace,” but they become human rights issues when China undertakes similar actions. “This is totally [a] double standard and Western propaganda. They are just badmouthing about China,” Lijian said. The Chinese diplomat asserted that Xinjiang is open to international visits, and people can go there to see for themselves that the rights of Uighur Muslims are fully protected.